Dolpac is a wide spectrum anthelmintic for dogs, featuring three active ingredients pyrantel, oxantel and praziquantel that fight against the most common roundworm and tapeworm species. This worming tablet is oval and can be easily broken into two pieces, making it easy to feed to your dog. Specifically used for the curative treatment of dogs harbouring mixed parasite infestations with the adult stages or nematode and cestode species: Toxocara canis, Toxacaris leonina, Ancylostoma caninum, Uncinaria stenocephala, Trichuris vulpis, Dipylidium caninum, Taenia spp. The advised dose rate is 20mg oxantel/ 5mg pyrantel/ 5mg praziquantel per kg bodyweight. Administer the required number of tablets according to body weight, orally, in one single administration. For the best results dogs should be fasted prior to treatment. Food can be given one hour or more after treatment. Dolpac tablets for medium dogs: 1 tablet/10kg body weight. 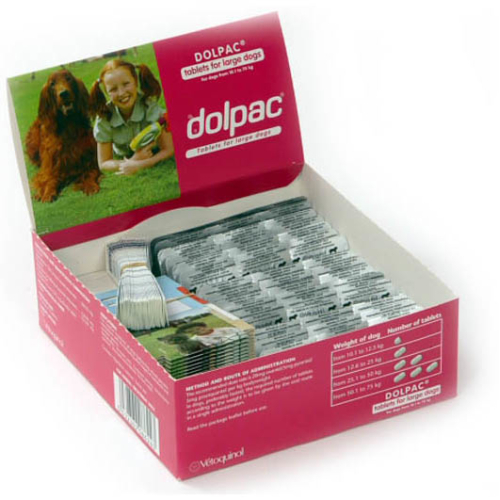 Dolpac tablets for large dogs: 1 tablet/ 25kg body weight.